I remember that event like it was yesterday. 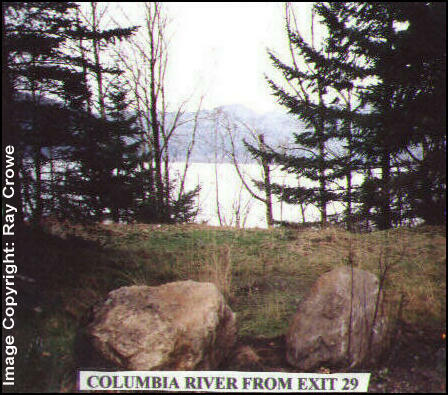 We decided the sasquatch were crossing the Columbia river under cover of darkness, then scrambling acroos the freeway (I-84) which parallels the river, to get to the wilderness of the Mt. Hood National Forest. A more lengthy treatment of this event can be found in Chapter 3 of 'The Locals'. Thanks to the BLC team for the 'shout out'. would that be the same freeway terry reams had his encounter?? Thanks Thom! For those few that do not have their own copy of 'The Locals' I provided a link to where fans can get signed copies. I'm grabbing my own copy off the shelf to read chapter 3 right now! What a cool sighting and investigation. This makes me more excited to travel to Oregon next week. Well this and it will be warmer than where I am now. Hi, I am Jason Boydston, my mom and I were the ones that had this sighting. I just stumbled upon your site while looking up our story. I remember talking with Thom on the phone within 20 minutes of almost running over Sasquatch. I think at the time it was the quickest sighting and reporting that Thom had. One more (big) thought about the print photograph above. 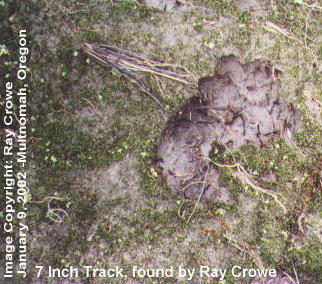 The lanky tall frame of the Bigfoot seen was probably that of teenager or young adult suggesting a footprint markings of something larger than 7 inches. 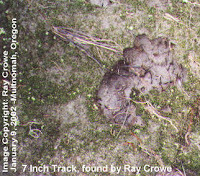 So with that premise the 7 inch track indicates a family group active in the area that night of our I-84 siting. 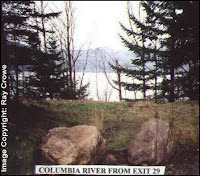 Younger family members are not bold at all, and are trained or instinctively stay under deeper cover, than being on I-84. Our adolescent sighting (7-8 feet tall)was caught on I-84 by us, froze by instinct until we passed, and then made stealthy movements back over the rail to protect him and his family hiding on the river side of I-84. His print should have been in the 15-18 inch range. 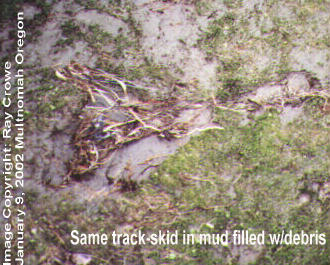 However investigation documented a small child print (photo) in the following days.